Research has shown that many consumers trust online reviews making them a key consideration in the purchase process. While it might feel like a body blow, there are things that you can do to lessen the impact of a poor online review or even come out on top after a poor review. It all comes down to how the review, and the customer doing the complaining, is dealt with. 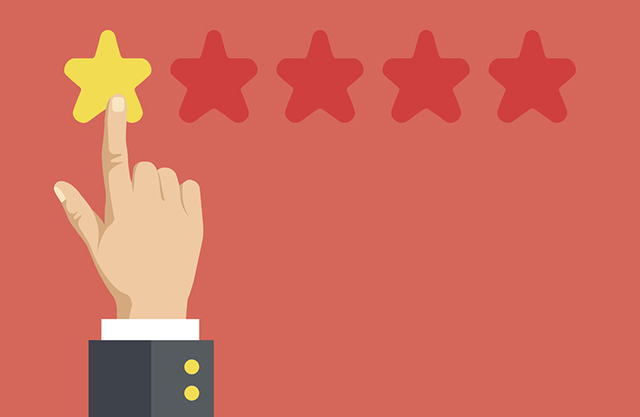 Remember, online review sites are popular with consumers and rank well on Google so it’s worth formulating a plan of action for handling negative reviews on sites like TripAdvisor and Yelp. While it’s true that how you approach each negative review will be determined by the review itself, it’s hard to overstate the importance of having a set procedure in place to act as a framework for responses. Lay out what is and isn’t acceptable when dealing with a negative review. Note down an acceptable timeframe for a response and when you might need to request further information from the reviewer. You’ll also want to include practical steps such as when a poor review should be escalated, who it should be escalated to and what your internal investigation processes are. For example, if you run a hotel and a guest has left a negative comment on TripAdvisor complaining about a rude member of staff, you may require the person responding to the review to also inform the front desk manager within 24 hours. A meeting may also need to be called with the offending staff member within two days. We all like to feel that our opinions and custom are valued. That makes it crucial to respond quickly to negative reviews. It might be an unpleasant task but a speedy response shows the unhappy customer that their issues are being taken seriously. 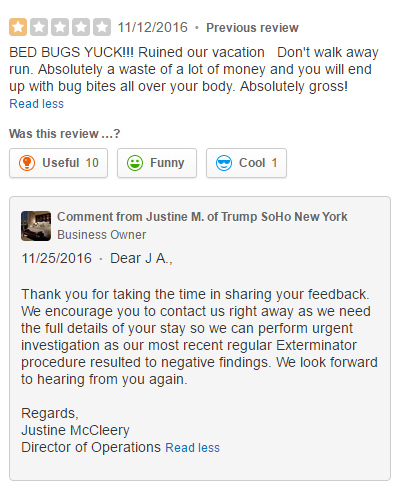 In the example above, the guest complaining about bed bugs during their stay had to wait almost two weeks for a response. The Director of Operations posted a good response but, the 12 day timeframe does not paint the hotel in the best light. It may be that you can’t solve the problem that led to the review being posted. You can however quickly acknowledge any shortcomings and apologise for the inconvenience or disappointment. You might want to request further information from the client to better help you deal with their review. For example, if they didn’t mention which of your locations caused their complaint. Gathering this information not only shows you’re taking the poor experience seriously, it also helps you to determine whether there is a wider issue to be addressed. Depending on the nature of the complaint, you may also want to invite the customer back to see you at your best. A diner complaining about having to wait too long to be served in your restaurant may respond well to an offer of a free cocktail next time for example. If you have already sent a private message, this public acknowledgement shows potential customers reading your reviews that you are pro-actively addressing the issue. If further follow up or discussion is needed following your private and or public response, it’s advisable to take the conversation offline or into a more private forum such as email. Do you put off dealing with negative reviews? Or have any tips to add based on your own experiences? Share your advice with us in the comments.